Parking: National Park Centre car park in Malham (grid reference SD 900 626). Leave the car park and turn left along the road towards the centre of Malham for about fifty yards past the Wesleyan chapel built in 1865 (Malham Methodist Church). Just short of the Buck Inn, turn right off the road over the footbridge. Once over the footbridge turn right along the wide gravelled path, through a wooden gate and continue ahead, now heading away from Malham. The way-marked path passes through a kissing gate, and keeps initially parallel with Malham Beck. Through the next kissing gate, follow the footpath sign for Janet's Foss along the path walled to the right, and with a fence on the left. Pass through two further kissing gates, then on to a further kissing gate, again going straight on, ignoring the footbridge to the right. Pass through another kissing gate and enter into the beautifully picturesque National Trust owned wooded ravine, which eventually leads up to Janet's Foss. The smell of the wild garlic (pungent wild ransom) and in spring, bluebells, dominate and carpet large sections of the wood. Foss is the old Scandinavian word for waterfall. According to legend Janet, or Jennet was the Queen of the local fairies and lived in a cave behind the waterfall. The cave was formed by limestone bedrock being dissolved and eroded by the action of water and re-deposited on mosses growing on the lip of the fall. This has caused a remarkable but fragile tufa screen that reaches to the plunge pool below. Take the path that climbs away up to the left of the waterfall to pass out through a kissing gate turning right onto a lane. As the road bends around to the right, follow the footpath sign for Gordale Scar to the left passing along the very broad path, initially passing through the Gordale Scar private campsite. Keep on the path as it draws around the corner to reveal the Scar itself. Gordale Scar is a narrow cannon towered on either side by sheer walls of rock, hundreds of feet high. Gordale Beck tumbles down the ravine, forming one final waterfall here over the tufa. 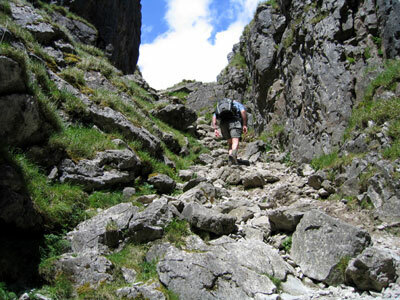 The walk now heads up the waterfall, but if you do not fancy the scramble, which is difficult in places and should not be attempted unless you are a fit and experienced walker, there is an alternative for the next two miles, which is described below. At first there does not really appear to be a path up the waterfall, but as the waterfall is approached a sketchy path can be seen to the left of it, which climbs steeply and involves some scrambling. After the initial scramble, the route becomes easier and passes a further waterfall up to the right, before heading slightly to the left passing up some man made steps. At the top the path swings around to the left and heads away from the valley below. Path eventually flattens and becomes grassier underfoot and easier to walk on, and then passes over a wall by way of a stone stile and continue on the same line following the sign for "Malham Tarn 2 miles". Follow the wide grassy path between a series of large cairns interspaced every hundred or so yards, through the limestone outcrops. As the limestone outcrops start to end, the path heads diagonally left across the field to pull in alongside the wall. As the wide path bends around to the right to run parallel with the wall, a more minor path heads off left continuing on the same direction to a stone stile in the wall a few yards ahead. Pass over the stone stile and turn right along the lane for a few yards (this is where the alternative path is joined) and then head to the right along the track, which keeps in close by the wall, ignoring the metalled road. From Gordale Scar return to the lane turning back right to cross the bridge then right through a gate following the "Malham Cove" sign. Follow the wide path across the field to the corner of the walls, and turn right up hill with the wall on the right hand side. Go over a wooden ladder stile and continue on up across the field to eventually pass up some man made steps and through a gate. Here turn left to follow a wide distinctive path by the wall to the left. Go through a further gate and keep on for another five hundred yards slowly rising and finally bending around to the right to pass through a kissing gate out onto a lane. Turn right onto the lane and follow mainly uphill for one and a quarter miles passing through old settlements and field systems. Just after a cattle grid the lane bears left away from the wall. Here turn right off the lane and keep on the track by the side of the wall. This is where the original route passing up through the Scar is rejoined. Both routes then continue along the track by the side of the wall and keep ahead at a 'T' junction at Street Gate. Street Gate is the junction of two ancient trans Pennine routes, the one currently being followed is from Arncliffe to Malham, whilst the east-west track is the route from Wharfedale to Ribblesdale. Keep on by the wall and as the track starts to pull away from the wall it heads down towards a small plantation ahead, where Malham Tarn can now be seen over to the left. As the plantation is reached, turn left off the track before reaching the cattle grid following a path along the side of the plantation (Great Close Plantation). The path keeps in close to the wall initially before keeping ahead as the wall bears to the right for a few hundred yards until a track is reached. Turn right onto the track and pass through the gate to enter the land around Malham Tarn. Follow the track around the tarn for as far as you want before returning back to the gate. It is possible to circle the tarn and then using the lanes meet this walk again by the roadside parking area at grid reference 893658. Malham Tarn is one of only two natural lakes in the Dales, the other being Semer Water. Malham Tarn is a bit of a peculiarity in this limestone landscape, but lies in a shallow basin along a major geological fault on a bed of Silurian slate. Pass back through the gate and walk a few yards back down the path following the "Pennine Way, Watersinks ¾ mile" sign, slowly rising over a knoll and then down to the road below. On reaching the road, turn right and go through the gate and over Malham Beck, then turn left following the footpath sign for "Footpath Malham Cove 1½ miles". Head away from the road for the wooden signpost a further fifty yards ahead, and then continue on diagonally left for a further sign near the wall. Ignore the footpath that goes off up the hill and again follow the Malham Cove sign. The path pulls into the wall by the stile and continues down the right hand side of the wall into the dry valley which forms a little further down. At the bottom of that the path swings around to the right and after a further fifty yards drops down to a wall. Here turn left over a wooden stile following sign for "Malham Cove ½ mile, Malham village 1 mile". Over the stile, the path drops steeply at first before flattening, passing through a kissing gate and continuing on between the Watlowes to the left and Ing Scar to the right. Pass over either of the two stone stiles in the wall and on for the limestone pavement just ahead. Fifty yards past the stiles, there is a gap in the wall on the left and a stile. Here turn right and cross the limestone pavement above Malham Cove. Great care must be taken here crossing the clints and grikes of the limestone, and also in not going to near the edge of the 230 foot high cove. Down below can be seen the very well defined path back to Malham. Over the limestone continue on until a wall is met into which is built a kissing gate. Pass through the kissing gate and head down the steep man-made steps. After a few minutes walking, pass through another gate and on down more steps to pass through a further gate and then take the right hand fork towards Malham. The left hand fork affords closer views of the cove. Keep on this path through a gate, next to which bird watchers can often be seen looking out for the Peregrines on the cliffs above. This wide gravelled path passes through another kissing gate and two further gates back out onto the road. Turn left onto the road and follow back into Malham for five hundred yards before turning right back into the car park.